So, I announced that the winner of the Bosses over at The Monthly Stitch (and any of my other friends following this blog, if they so chose to do so), voted on which pattern I was to make for the March sewing challenge. The winner was the swimsuit pattern from Kwik Sew – Pattern # 3503. Upon looking over the material I discovered that I was just a little short in the amount needed (but figured I could work around the layout and get all the pieces out of the material I had on hand…), well that didn’t quite work out. I also discovered that there was a flaw in the material, which didn’t bother me much as I planned on using that section for the lining of the suit. Now, I since I didn’t plan properly, I ended up short on the material. So with a scrap in hand along with the label from the remnant piece, I was off to the fabric store. What did I find? That the material was discontinued, and there was none left in the clearance section. Now what do I do?? Then it dawned on me – Color Block! I picked up a black poly/spandex to complete the suit. 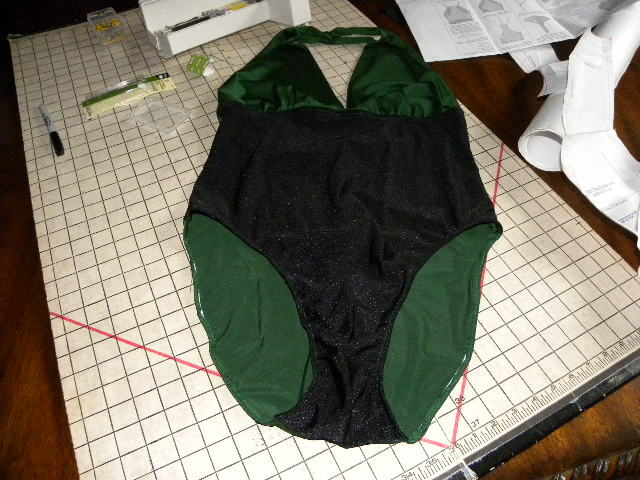 I also picked up enough to make a second swimsuit with any adjustments I found necessary after completing the first suit. I used the high cut leg openings (which ended up being a little bit too high for my current body shape). I sewed it on my regular machine, using zigzag stitching. My biggest challenge was getting the elastic in properly for the legs and around the midriff. The back tush of the suit is a bit saggy, because, well, I don’t have much of a tush, so I will take that in a bit. Wow, did you ever sew that up fast!! 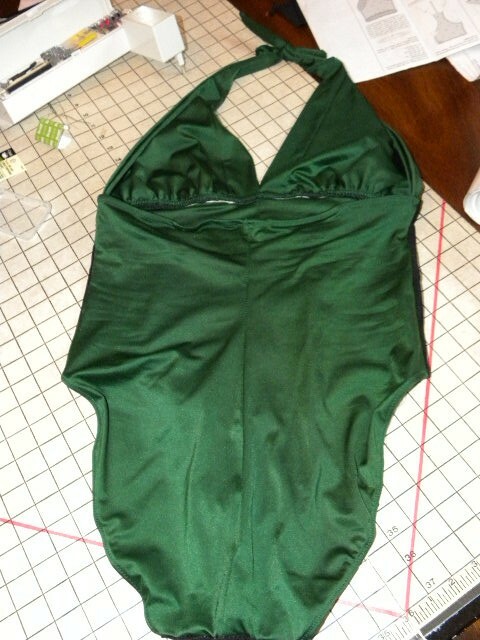 I love the green fabric and looks to be a very flattering swimsuit! That really was super speedy! Great looking swimsuit! Impressive! I never get going going right away on a challenge … It takes me 3 weeks to get started leaving me with just a few days to finish! Nice work! Love the deep green! Gorgeous!